4 - Variants. 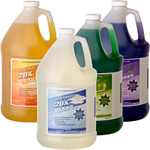 This one-of-kind, industrial strength multi purpose cleaner has hundred of uses. Cleans just about everything. Eco-friendly and safe around children and pets. For light colored carpets and fabrics.